Flat Stanley… around the country and back home again! DCT’s National Tour of THE MUSICAL ADVENTURES OF FLAT STANLEY hit the road at the beginning of DCT’s 2014-2015 Season in September, and has covered 71 cities in 30 states and one Canadian Province with 174 performances. The touring production and its lively music was met by raves from audiences everywhere and is now dazzling hometown playgoers. 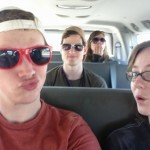 Caroline Dubberly, who was part of the touring ensemble shared some tour highlights and some fabulous candid photos just for Dallas audiences. What was your greatest memory of the tour? 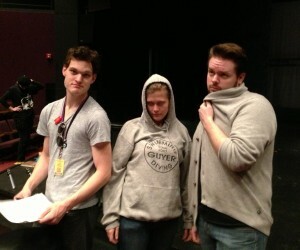 Justin Duncan, Caroline Dubberly, James Chandler at our venue in St Catherine, Canada. My greatest memory of the tour would have to be the performance we did on Thanksgiving at St. Catherine’s in Canada. It was the first venue we had where the space was too small to fit our set in, and we were only to meet for about an hour the night before to basically redraft the entire show as a concert version that could suit the space. We planned to rehearse in the morning, during our load in time before our performance, but of course everything kept going wrong so we basically had to improvise the show and trust our instincts and each other to do the best show we could. It really was a magical experience. The kids and adults had such a positive and visceral reaction to the piece, and it ended up being one of the most rewarding experiences for me. How did kids react to the show, and what was their favorite part? We were really lucky in that we got positive reactions to the show everywhere we went. There was always a lot of excitement from kids and adults alike. 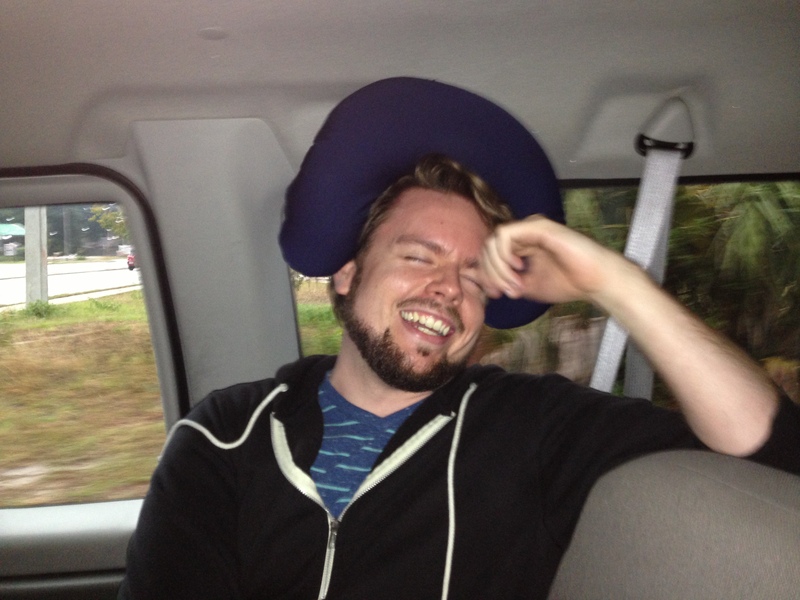 James Chandler modeling one of the many uses for travel pillows. I think the part that got the biggest reaction was probably the singing of “I Wish I Were”, or the part where Stanley comes out in the silly Bo Peep costume. My favorite part of the show to perform is the Sneak Thief. She’s such a silly character, so unencumbered by normal speech patterns and physicality, so I got to explore a whole new range of acting every time I did it. Also that part of the script lends itself to a bit of audience interaction, and it was always so fun when the kids got really into it. 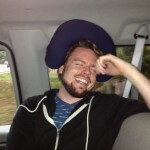 Any secrets you can share from months on the road? As far as tour secrets to share… Continental breakfasts are the best at Best Western. And travel pillows can change your life. And touring was made so much easier for me because I brought my stuffed animal/best bud Simba. Whether or not you and your kids mailed or received a Flat Stanley, you will enjoy the lively music, and the quirky humor of this show about exploring the world and learning to appreciate home. DCT touring casts always have fun, and by the time they make it back to Dallas, their chemistry and physical humor are fine tuned. This is a show you and your family won’t want to miss! Friday, June 26 at 7:30 p.m.
Sunday, June 28 – 1:30 p.m.
Saturday, July 11at 1:30 p.m. & 4:30 p.m.
Sunday, July 12 at 1:30 & 4:30 p.m.
Flat Stanley has traveled across the world and is making his way to Dallas Children’s Theater June 19 – July 12. Because preserving the environment is so important to Stanley’s travels, Green Mountain Energy’s own mascot, Super Earth, will be joining him at the theater for opening night! Green Mountain Energy is committed to serving its customers renewable energy generated from clean resources like sun and wind. 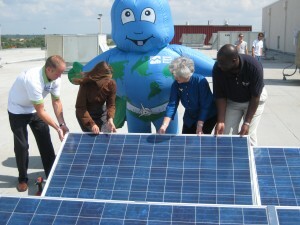 The Sun Club chose to donate solar power to Dallas Children’s Theater in 2010 because of its mission to support the Dallas community in a sustainable way. Learn more about this solar project on the Green Mountain website. “Dallas Children’s Theater has done some amazing work to bring the community together, and we’re proud to support them with solar power,” said Tony Napolillo, program manager of the Sun Club. Opening night activities will include a table set up for kids to color their own Flat Super Earth or planet Earth. Our mascot, Super Earth will also be there to greet the kids and pose for pictures. 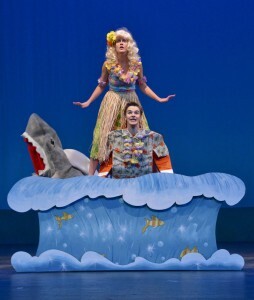 Read more about DCT’S The Musical Adventure of Flat Stanley, click here.